Club SA Casino is an online casino including mobile games, established in 2004 using games powered by Real time gaming software. It is operated by BeSoftware N.V. and is licensed under the jurisdictions of Curaçao. People have always admired the beauty in South Africa. It is known for its beauty, majestic scenery and landscapes. Now, apart from the wonderful serenity and splendor, we give you another reason to like South Africa more and more, which is Club SA. 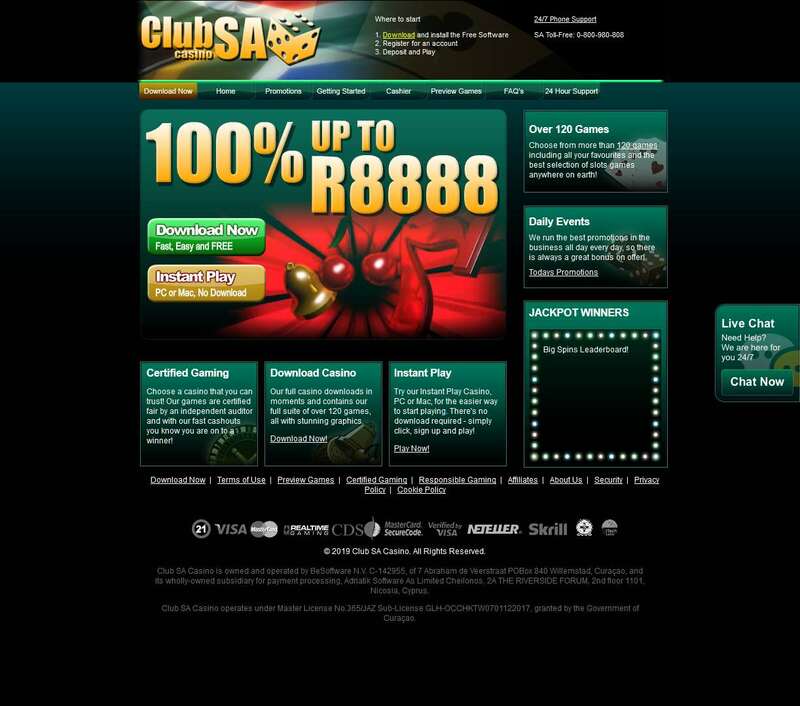 Club SA began its online gaming facility in 2004. It is a part of the Club World group of casinos and is known all over in providing the best online gaming facilities to the player. Club SA works to provide all the players delightful gaming experience. In order to ensure that all their players stay satisfied, they give proper attention to each and every one. It gives you a panoramic view that remains giving you a pleasant atmosphere and superb games that give you a chance to win amazing prizes; one can never get bored of Club SA. All players will be granted a welcome bonus when they make their first deposit. Also, there are much attractive promotion offers that the players will be offered to on a daily basis. The plays through requirements in Club SA are lower than many other online casinos. Players are given a special promotion for an opportunity to receive free chips. To claim the promotional deposit for free chips players will have to enter a unique code at the cashier. You can also earn Comp Points for every game played. These comp points can be redeemed for cash. Every 100 points can be converted into $1 in cash. The more one plays the more one can earn. There are many games available at Club SA. It offers Real Time Gaming Software which has an efficient team that specializes in bringing as many games as possible to the players. It offers world-class graphics and design adding to make your games even better. The slots are as realistic as Brick and Mortar Casino games. Real Time gaming software was introduced in 1999. Since then it has been a hit among the gaming market. A good online casino will always take extreme care of two things. The first is safety, an encryption program that scrambles sensitive data from your computer to Club SA’s server are scrambled in the process. All the data of the player and the transactions are kept under strict security and it is ensured that no information is ever leaked out to any third party. Games are certified as being fair through the Random Number Generator. Club SA is licensed under the laws of Curacao.